In fact, the first available 964 was the all wheel drive Carrera 4, assumedly to fully differentiate it from the previous model, with nominally 69% of torque applied to the rear and 31% to the front. However up to100% of torque could be applied to the front or rear as needed when wheel spin was detected. The 964 is caught between the last of the "Original" 911's (The Carrera 3.2's) and the last of the air cooled 911's (the 993), and has suffered as a bit of a step child because of this. But to my mind, they retain enough of the classic 911 design to stay true to the original, while adding many of the improvements that one might add to a Carrera 3.2 if the resources were available. It's hard to argue that a more powerful 3.6 liter engine and much improved suspension don't make for a better car than the 3.2. 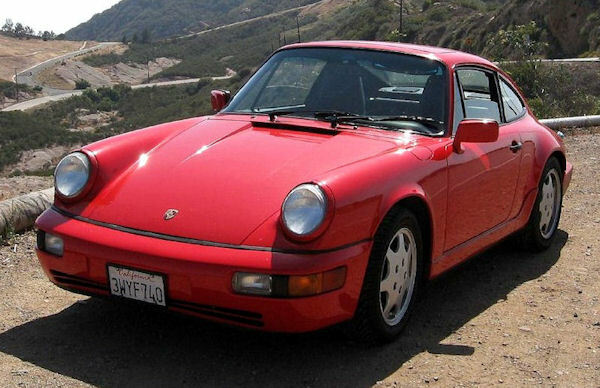 And while many see the model 993 as the end all of air cooled 911's, I find it strays a little too far from the original design for it's own good. The 964 is instantly recognizable by most anyone as a "911", yet is modern enough for comfortable daily use.